Collaboration. It’s a term I hear at least a few times a day when speaking to my user base. The ability to seamlessly collaborate with team members, across the organization, with trusted partners, and with customers is a must. It’s a driving force between much of the evolution of software-as-a-service collaboration offerings such as Office 365. While the industry is evolving to make collaboration easier than ever, it’s also introducing significant challenges for organizations to protect and control their data. In a recent post I talked about Microsoft’s entry into the cloud access security broker (CASB) market with Cloud App Security (CAS) and its capability to provide auditing and alerting on activities performed in Amazon Web Services (AWS). Microsoft refers to this collection of features as the Investigate capability of CAS. Before I cover an example of the Control features in action, I want to talk about the product that works behind the scenes to provide CAS with many of the Control features. That product is Azure Information Protection (AIP) and it provides the capability to classify, label, and protect files and email. The protection piece is provided by another Microsoft product, Azure Active Directory Rights Management Services (Azure RMS). Beyond just encrypting a file or email, Azure RMS can control what a user can do with a file such as preventing a user from printing a document or forwarding an email. The best part? The protection goes with the data even when it leaves your security boundary. For those of you that have read my blog you can see that I am a huge fanboy of the predecessor to Azure RMS, Active Directory Rights Management Services (AD RMS, previously Rights Management Service or RMS for you super nerds). AD RMS has been a role available in Microsoft Windows Server since Windows Server 2003. It was a product well ahead of its time that unfortunately never really caught on. Given my love for AD RMS, I thought it would be really fun to do a series looking at how AIP has evolved from AD RMS. It’s a dramatic shift from a rather unknown product to a product that provides capabilities that will be as standard and as necessary as Antivirus was to the on-premises world. I built a pretty robust lab environment (two actually) such that I could demonstrate the different ways the solutions work as well as demonstrate what it looks to migrate from AD RMS to AIP. Given the complexity of the lab environment, I’m going to take this post to cover what I put together. On the modern end I have an Azure AD tenant with the custom domain assigned of geekintheweeds.com. Attached to the tenant I have some Office 365 E5 and Enterprise Mobility + Security E5 trial licenses For the legacy end I have two separate labs setup in Azure each within its own resource group. Lab number one contains three virtual machines (VMs) that run a series of services included Active Directory Domain Services (AD DS), Active Directory Certificate Services (AD CS), AD RMS, and Microsoft SQL Server Express. Lab number two contains four VMs that run the same set as services as Lab 1 in addition to Active Directory Federation Services (AD FS) and Azure Active Directory Connect (AADC). The virtual network (vnet) within each resource group has been peered and both resource groups contain a virtual gateway which has been configured with a site-to-site virtual private network (VPN) back to my home Hyper-V environment. In the Hyper V environment I have two workstations. Lab 1 is my “legacy” environment and consists of servers running Windows 2008 R2 and Windows Server 2012 R2 (AD RMS hasn’t changed in any meaningful manner since 2008 R2) and a client running Windows 7 Pro running Office 2013. The DNS namespace for its Active Directory forest is JOG.LOCAL. Lab 2 is my “modern” environment and consists of servers running Windows Server 2016 and a Windows 10 client running Office 2016 . It uses a DNS namespace of GEEKINTHEWEEDS.COM for its Active Directory forest and is synchronized with the Azure AD tenant I mentioned above. AD FS provides SSO to Office 365 for Geek in The Weeds users. For AD RMS configuration, both environments will initially use Cryptographic Mode 1 and will have a trusted user domain (TUD). SQL Server Express will host the AD RMS database and I will store the cluster key locally within the database. The use of a TUD will make the configuration a bit more interesting for reasons you’ll see in a future post. In my next post I’ll cover how the architecture changes when migrating from AD RMS to Azure Information Protection. It seems like it’s become a weekly occurrence to have sensitive data exposed due to poorly managed cloud services. Due to Amazon’s large market share with Amazon Web Services (AWS) many of these instances involve publicly-accessible Simple Storage Service (S3) buckets. In the last six months alone there were highly publicized incidents with FedEx and Verizon. While the cloud can be empowering, it can also be very dangerous when there is a lack of governance, visibility, and acceptance of the different security mindset cloud requires. Organizations that have been in operation for many years have grown to be very reliant on the network boundary acting as the primary security boundary. As these organizations begin to move to a software defined data center model this traditional boundary quickly becomes less and less effective. Unfortunately for these organizations this, in combination with a lack of sufficient understanding of cloud, gives rise to mistakes like sensitive data being exposed. One way in which an organization can protect itself is to leverage technologies such as cloud access security brokers (cloud security gateways if you’re Forrester reader) to help monitor and control data as it travels between on-premises and the cloud. If you’re unfamiliar with the concept of a CASB, I covered it in a previous entry and included a link to an article which provides a great overview. Microsoft has its own CASB offering called Microsoft Cloud App Security (CAS). It’s offered as part of Microsoft’s Enterprise Mobility and Security (EMS) E5/A5 subscription. Over the past several months multiple connectors to third party software-as-a-service (SaaS) providers have been introduced, including one for AWS. The capabilities with AWS are limited at this point to pulling administrative logs and user information but it shows promise. As per usual, Microsoft provides an integration guide which is detailed in button pushing, but not so much in concepts and technical details as to what is happening behind the scenes. Since the Azure AD and AWS blog series has attracted so many views, I thought it would be fun and informative to do an entry for how Cloud App Security can be used with AWS. I’m not in the habit of re-creating documentation so I’ll be referencing the Microsoft integration guide throughout the post. 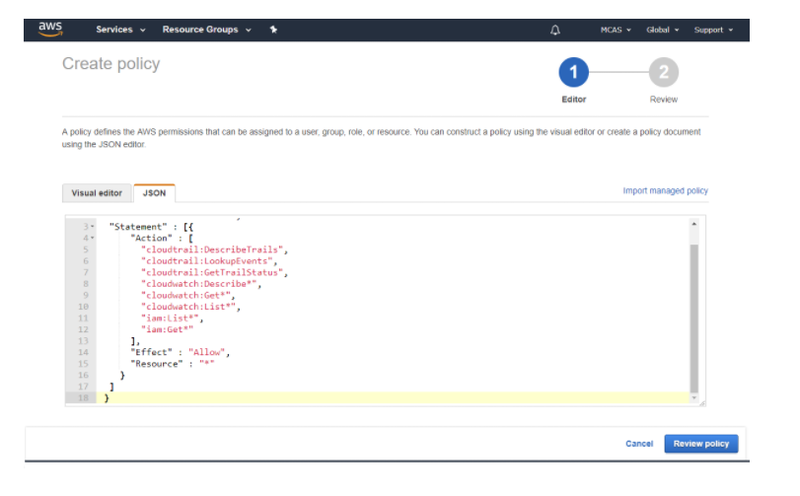 The first thing that needs doing is the creation of a security principal in AWS Identity and Access Management (AWS IAM) that will be used by your tenant’s instance of CAS to connect to resources in your AWS account. The first four steps are straightforward but step 5 could a bit of an explanation. Here we’re creating a custom IAM policy for the security principal granting it a number of permissions within the AWS account. IAM policies are sets of permissions which are attached to a human or non-human identity or AWS resource and are evaluated when a call to the resource is made. In the traditional on-premises world, you can think of it as something somewhat similar to a set of NTFS file permissions. When the policy pictured above is created the security principal is granted a set of permissions across all instances of CloudTrail, CloudWatch, and IAM within the account. If you’re unfamiliar with AWS services, CloudTrail is a service which audits the API calls made to AWS resources. Some of the information included in the events include the action taken, the resource the action was taken upon, the security principal that made the action, the date time, and source IP address of the security principal who performed the action. The CloudWatch service allows for monitoring of metrics and optionally triggering events based upon metrics reaching specific thresholds. The IAM service is AWS’s identity store for the cloud management layer. Now that we have a basic understanding of the services, let’s look at the permissions Microsoft is requiring for CAS to do its thing. The CloudTrail permissions of DescribeTrails, LookupEvents, and GetTrailStatus allow CAS to query for all trails enabled on an AWS account (CloudTrail is enabled by default on all AWS resources), lookup events in a trail, and get information about the trail such as start and stop logging times. The CloudWatch permissions of Describe* and Get* are fancy ways of asking for READ permissions on CloudWatch resources. These permissions include describe-alarms-history, describe alarms, describe-alarms-for-metric, get-dashboard, and get-metric-statistics. The IAM permissions are similar to what’s being asked for in CloudWatch, basically asking for full read. Step number 11 instructs us to create a new CloudTrail trail. AWS by default audits all events across all resources and stores them for 90 days. Trails enable you to direct events captured by CloudTrail to an S3 bucket for archiving, analysis, and responding to events. The trail created is consumed by CAS to read the information captured via CloudTrail. The permissions requested above become a bit more clear now that we see CAS is requesting read access for all trails across an account for monitoring goodness. I’m unclear as to why CAS is asking for read for CloudWatch alarms unless it has some integration in that it monitors and reports on alarms configured for an AWS account. The IAM read permissions are required so it can pull user information it can use for the User Groups capability. After the security principal is created and a sample trail is setup, it’s time to configure the connector for CAS. Steps 12 – 15 walk through the process. When it is complete AWS now shows as a connected app. After a few hours data will start to trickle in from AWS. Navigating to the Users and Accounts section shows all of the accounts found in the IAM instance for my AWS account. Envision this as your one stop shop for identifying all of the user accounts across your many cloud services. A single pane of glass to identity across SaaS. On the Activity Log I see all of the API activities captured by CloudTrail. If I wanted to capture more audit information, I can enable CloudTrail for the relevant resource and point it to the trail I configured for CAS. I haven’t tested what CAS does with multiple trails, but based upon the permissions we configured when we setup the security principal, it should technically be able to pull from any trail we create. Since the CAS and AWS integration is limited to pulling logging information, lets walk through an example of how we could use the data. Take an example where an organization has a policy that the AWS root user should not be used for administrative activities due to the level of access the account gets by default. The organization creates AWS IAM users accounts for each of its administrators who administer the cloud management layer. In this scenario we can create a new policy in CAS to detect and alert on instances where the AWS root user is used. First we navigate to the Policies page under the Control section of CAS. On the Policies page we’re going to choose to create a new policy settings in the image below. We’ll designate this as a high severity privileged account alert. We’re interested in knowing anytime the account is used so we choose the Single Activity option. We’ll pretend we were smart users of CAS and let it collect data for a few weeks to get a sampling of the types of events which are captured and to give us some data to analyze. We also went the extra mile and leveraged the ability of CAS to pull in user information from AWS IAM such that we can choose the appropriate users from the drop-down menus. Since this is a demo and my AWS lab has a lot of activity by the root account we’re going to limit our alerts to the creation of new AWS IAM users. To do that we set our filter to look for an Activity type equal to Create user. Our main goal is to capture usage of the root account so we add another filter rule that searches for a User with the name equal to aws root user where it is the actor in an event. Finally we configure the alert to send an email to the administrator when the event occurs. The governance capabilities don’t come into play in this use case. Next we jump back to AWS and create a new AWS IAM user named testuser1. A few minutes after the user is created we see the event appearing in CloudTrail. After a few minutes, CAS generates and alert and I receive an email seen in the image below. I’m given information as to the activity, the app, the date and time it was performed, and the client’s IP address. If I bounce back to CAS I see one new Alert. Navigating to the alert I’m able to dismiss it, adjust the policy that generated it, or resolve it and add some notes to the resolution. I also have the option to dig deeper to see some of the patterns of the user’s behavior or the pattern of the behaviors from a specific IP address as seen below. All this information is great, but what can we do with it? In this example, it delivers visibility into the administrative activities occurring at the AWS cloud management layer by centralizing the data into a single repository which I can then send other data such as O365 activity, Box, SalesForces, etc. By centralizing the information I can begin doing some behavioral analytics to develop standard patterns of behavior of my user base. Understanding standard behavior patterns is key to being ahead of the bad guys whether they be insiders or outsiders. I can search for deviations from standard patterns to detect a threat before it becomes too widespread. I can also be proactive about putting alerts and enforcement (available for other app connectors in CAS but not AWS at this time) to stop the behavior before the threat is realized. If I supplemented this data with log information from my on-premises proxy via Cloud App Discovery, I get an even larger sampling improving the quality of the data as well as giving me insight into shadow IT. Pulling those “shadow” cloud solutions into the light allow me to ensure the usage of the services complies with organizational policies and opens up the opportunity of reducing costs by eliminating redundant services. Microsoft categorizes the capabilities that help realize these benefits as the Discover and Investigate capabilities of CAS. The solution also offers a growing number of enforcement mechanisms (Microsoft categorized these enforcement mechanisms as Control) which add a whole other layer of power behind the solution. Due to the limited integration with AWS I can’t demo those capabilities with this post. I’ll cover those in a future post. I hope this post helped you better understand the value that CASB/CSGs like Microsoft’s Cloud App Security can bring to the table. While the product is still very new and a bit sparse on support with 3rd party applications, the list is growing every day. I predict the capabilities provided by technology such as Microsoft’s Cloud App Security will be as standard to IT as a firewall in the years to come. If you’re already in Office 365 you should be ensuring you integrate these capabilities into your arsenal to understand the value they can bring to your business. Well folks, it’s time to wrap up this series on Azure Active Directory Domain Services (AAD DS). In my first post I covered the basic configurations of the managed domain and in my second post took a look at how well Microsoft did in applying security best practices and complying with NIST standards. In this post I’m going to briefly cover the LDAPS over the Internet capability, summarize some key findings, and list out some improvements I’d like to see made to the service. One of the odd features Microsoft provides with the AAD DS service is the ability to expose the managed domain over LDAPS to the Internet. I really am lost as to the use case that drove the feature. LDAP is very much a legacy on-premises protocol that has no place being exposed to risks of the public Internet. It’s the last thing that should the industry should be encouraging. Just because you can, doesn’t mean you should. Now let me step off the soap box and let’s take a look at the feature. As I covered in my last post LDAPS is not natively enabled in the managed domain. The feature must be configured and enabled through the Azure Portal. The configuration consists of uploading the private key and certificate the service will use in the form of a PKCS12 file (*.PFX). The certificate has a few requirements that are outlined in the instructions above. After the certificate is validated, it takes about 10-15 minutes for the service to become available. Beyond enabling the service within the VNet, you additionally have the option to expose the LDAPS endpoint to the Internet. Microsoft provides instructions on how to restrict access to the endpoint to trusted IPs via a network security group (NSG) because yeah, exposing an LDAP endpoint to the Internet is just a tad risky. To lock it down you simply associate an NSG with the subnet AAD DS is serving. Once that is done enable the service via the option in the image above and wait about 10 minutes. After the service is up, register a external DNS record for the service that points to the IP address noted under the properties section of the AADS blade and you’re good to go. For my testing purposes, I locked the external LDAPS endpoint down to the public IP address my Azure VM was SNATed to. After that I created an entry in the host file of the VM that matched the external DNS name I gave the service (whyldap.geekintheweeds.com) to the public IP address of the LDAPS endpoint in order to bypass the split-brain DNS challenge. Initiating a connection from LDP.EXE was a success. Now that we know the service is running, let’s check out what the protocol support and cipher suite looks like. Again we see the use of deprecated cipher suites. Here the risk is that much greater since a small mistake with an NSG could expose this endpoint directly to the Internet. If you’re going to use this feature, please just don’t. If you’re really determined to, don’t screw up your NSGs. The more objects in the directory, the more expensive the service. Users and groups can be created directly in managed domain after a new organizational unit is created. Password and lockout policy is insanely loose to the point where I can create an account with a three character password (just need to meet complexity requirements) and accounts never lockout. The policy cannot be changed. RC4 encryption ciphers are enabled and cannot be disabled. NTLMv1 is enabled and cannot be disabled. The service does not support smart-card enforced users. Yes, that includes both the users synchronized from Azure AD as well as any users you create directly in the managed domain. If I had to guess, it’s probably due to the fact that you’re not a Domain Admin so hence you can’t add to the NTAuth certificate store. LDAPS is not enabled by default. Schema extensions are not supported. Account-Based Kerberos Delegation is not supported. If you are syncing identities to Azure AD, you’ll also need to synchronize your passwords. The managed domain is very much “out of the box” defaults. Recovery of deleted objects created directly in the managed domain is not possible. The rights have not been delegated to the AADC Administrator. My verdict on AAD DS is it’s not a very useful service in its current state. Beyond small organizations, organizations that have very little to no requirements on legacy infrastructure, organizations that don’t have strong security requirements, and dev/qa purposes I don’t see much of a use for it right now. It comes off as a service in its infancy that has a lot of room to grow and mature. Microsoft has gone a bit too far in the standardization/simplicity direction and needs to shift a bit in the opposite direction by allowing for more customization, especially in regards to security. I’d really like to see Microsoft introduce the capabilities below. All of them should exposed via the resource blade in the Azure Portal if at all possible. It would provide a singular administration point (which seems to be the strategy given the move of Azure AD and Intune to the Azure Portal) and would allow Microsoft to control how the options are enabled in the managed domain. This means no more administrators blowing up their Active Directory forest because they accidentally shut off all the supported cipher suites for Kerberos. Option to restore deleted users and groups that were created directly in the managed domain. If you’re allow creation, you need to allow for restoration. Removal of Internet-accessible LDAPS endpoint feature or at least somehow incorporate the NSG lockdown feature directly into the AAD DS blade. While the service has a lot of room for improvement the direction of a managed Windows AD offering is spot on. In the year 2018, there is no reason Windows AD shouldn’t be offered as a managed service. The direction Microsoft has gone by sourcing the identities and credentials from Azure AD is especially creative. It’s a solid step in the direction of creating a singular centralized identity service that provides both legacy and modern protocols. I’ll be watching this service closely as Microsoft builds upon it for the next few months. Thanks and see you next post! Welcome back to part 2 of my series on Microsoft’s managed services offering of Azure Active Directory Domain Services (AAD DS). In my first post I covered so some of the basic configuration settings of the a default service instance. In this post I’m going to dig a bit deeper and look at network flows, what type of secure tunnels are available for LDAPS, and examine the authentication protocols and supporting cipher suites are configured for the service. To perform these tests I leveraged a few different tools. For a port scanner I used Zenmap. To examine the protocols and cipher suites supported by the LDAPS service I used a custom openssl binary running on an Ubuntu VM in Azure. For examination of the authentication protocol support I used Samba’s smbclient running on the Ubuntu VM in combination with WinSCP for file transfer, tcpdump for packet capture, and WireShark for packet analysis. Let’s start off with examining the open ports since it takes the least amount of effort. To do that I start up Zenmap and set the target to one of the domain controllers (DCs) IP addresses, choose the intense profile (why not? ), and hit scan. Once the scan is complete the results are displayed. Navigating to the Ports / Hosts tab displays the open ports. All but one of them are straight out of the standard required ports you’d see open on a Windows Server functioning as an Active Directory DC. An opened port 443 deserves more investigation. Let’s start with the obvious and attempt to hit the IP over an HTTPS connection but no luck there. Let’s break out Fiddler and hit it again. If we look at the first session where we build the secure tunnel to the website we see some of the details for the certificate being used to secure the session. Opening the TextView tab of the response shows a Subject of CN=DCaaS Fleet Dc Identity Cert – 0593c62a-e713-4e56-a1be-0ef78f1a2793. Domain Controller-as-a-Service, I like it Microsoft. Additionally Fiddler identifies the web platform as the Microsoft HTTP Server API (HTTP.SYS). Microsoft has been doing a lot more that API since it’s much more lightweight than IIS. I wanted to take a closer look at the certificate so I opened the website in Dev mode in Chrome and exported it. The EKUs are normal for a standard use certificate and it’s self-signed and untrusted on my system. The fact that the certificate is untrusted and Microsoft isn’t rolling it out to domain-joined members tells me whatever service is running on the port isn’t for my consumption. So what’s running on that port? I have no idea. The use of the HTTP Server API and a self-signed certificate with a subject specific to the managed domain service tells me it’s providing access to some type of internal management service Microsoft is using to orchestrate the managed domain controllers. If anyone has more info on this, I’d love to hear it. Let’s now take a look at how Microsoft did at securing LDAPS connectivity to the managed domain. LDAPS is not enabled by default in the managed domain and needs to be configured through the Azure AD Domain Services blade per these instructions. Oddly enough Microsoft provides an option to expose LDAPS over the Internet. Why any sane human being would ever do this, I don’t know but we’ll cover that in a later post. I wanted to test SSLv3 and up and I didn’t want to spend time manipulating registry entries on a Windows client so I decided to spin up an Ubuntu Server 17.10 VM in Azure. While the Ubuntu VM was spinning up, I created a certificate to be used for LDAPS using the PowerShell command referenced in the Microsoft article and enabled LDAPS through the Azure AD Domain Services resource in the Azure Portal. I did not enable LDAPS for the Internet for these initial tests. After adding the certificate used by LDAPS to the trusted certificate store on the Windows Server, I opened LDP.EXE and tried establishing LDAPS connection over port 636 and we get a successful connection. Once I verified the managed domain was now supporting LDAPS connections I switched over to the Ubuntu box via an SSH session. Ubuntu removed SSLv3 support in the OpenSSL binary that comes pre-packaged with Ubuntu so to test it I needed to build another OpenSSL binary. Thankfully some kind soul out there on the Interwebz documented how to do exactly that without overwriting the existing version. Before I could build a new binary I had to add re-install the Make package and add the Gnu Compiler Collection (GCC) package using the two commands below. After the two packages were installed I built the new binary using the instructions in the link, tested the command, and validated the binary now includes SSLv3. After Poodle hit the news back in 2014, Microsoft along with the rest of the tech industry advised SSLv3 be disabled. Thankfully this basic well known vulnerability has been covered and SSLv3 is disabled. SSLv3 is disabled, but what about TLS 1.0, 1.1, and 1.2? How about the cipher suites? Are they aligned with NIST guidance? To test that I used a tool named TestSSLServer by Thomas Pornin. It’s a simple command line tool which makes cycling through the available cipher suites quick and easy. The command produces the output below. As can be seen from the bolded output above, Microsoft is still supporting the RC4 cipher suites in the managed domain. RC4 has been known to be a vulnerable algorithm for years now and it’s disappointing to see it still supported especially since I haven’t seen any options available to disable within the managed domain. While 3DES still has a fair amount of usage, there have been documented vulnerabilities and NIST plans to disallow it for TLS in the near future. While commercial customers may be more willing to deal with the continued use of these algorithms, government entities will not. Again we see more support for RC4 which should be a big no no in the year 2018. This is a risk that orgs using AAD DS will need to live with unless Microsoft adds some options to harden the managed DCs. Last but not least I was curious if Microsoft had support for NTLMv1. By default Windows Server 2012 R2 supports NTLMv1 due to requirements for backwards compatibility. Microsoft has long recommended disabling NTLMv1 due to the documented issues with the security of the protocol. So has Microsoft followed their own advice in the AAD DS environment? To check this I’m going use Samba’s smbclient package on the Ubuntu VM. I’ll use smbclient to connect to the DC’s share from the Ubuntu box using the NTLM protocol. Samba has enforced the use NTLMV2 in smbclient by default so I needed to make some modifications to the global section of the smb.conf file by adding client ntlmv2 auth = no. This option disables NTLMv2 on smbclient and will force it to use NTLMv1. While I ran the command I also did a packet capture using tcpdump which I moved over to my Windows box using WinSCP. I then opened the capture with WireShark and navigated to the packet containing the Session Setup Request. In the parsed capture we don’t see an NTLMv2 Response which means NTLMv1 was used to authenticate to the domain controller indicating NTLMv1 is supported by the managed domain controllers. Based upon what I’ve observed from poking around and running these tests I’m fairly confident Microsoft is using a very out-of-the-box configuration for the managed Windows Active Directory domain. There doesn’t seem to be much of an attempt to harden the domain against some of the older and well known risks. I don’t anticipate this offering being very appealing to organizations with strong security requirements. Microsoft should look to offer some hardening options that would be configurable through the Azure Portal. Those hardening options are going to need to include some type of access to the logs like I mentioned in my last post. Anyone who has tried to rid their network of insecure cipher suites or older authentication protocols knows the importance of access to the domain controller logs to the success of that type of effort. My next post will be the final post in this series. I’ll cover the option Microsoft provides to expose LDAPS to the Internet (WHY OH WHY WOULD YOU DO THAT? ), summarize my findings, and mention a few other interesting things I came across during the study for this series.